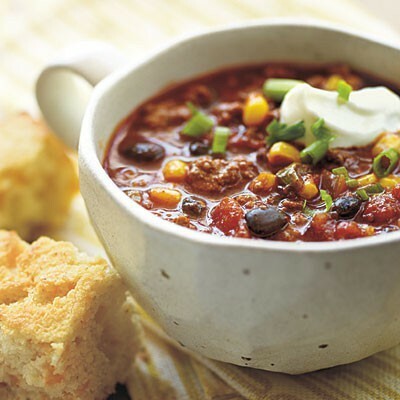 Today is National Chili Day, which is celebrated on the last Thursday of the month of February. In honor of this glorious day I thought I would share my favorite chili recipe. At our tailgate, we typically have one game of the year dedicated to a "chili cook-off". Everyone brings their favorite chili but we always have multiple varieties - buffalo, turkey, vegetarian, chicken and chili dogs. Chili is such a great gameday dish. Brown beef in a large skillet in 1 tablespoon olive oil until well browned. Set aside. Add another tablespoon olive oil to skillet and saute onion and garlic until fragrant but overly cooked. Add celery and red pepper, cook until soft. Add jalapeno and saute for 5 minutes. Return beef to pan and heat, season with salt and pepper. Add beer and scrape up any of the brown bits from bottom of the skillet. Add tomato, chili powder, paprika, cumin and cocoa powder. Bring to a boil, then reduce the heat to low, cover and simmer for 2 hours. Gently mix in kidney bean, black beans, corn and lime juice. Simmer for another 30 minutes. Garnish with cheddar cheese, red onion and avocado. Serve with cornbread or rice. 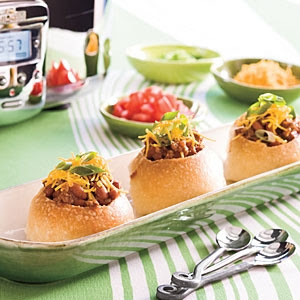 Don't forget about these cute Chili Bites from Southern Living. I love this idea!